I've got a hot hussy for you today! Her name is Angelique and she packs a real punch. 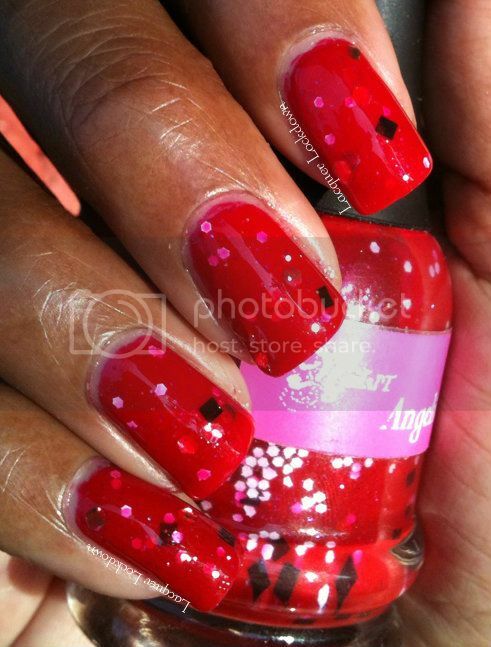 Angelique is a red jelly polish filled with black squares small white hexagons, medium gold hexagons and hot pink microglitter. It's part of six piece collection inspired by the Dark Shadows movie that released earlier this summer, and made by a lady who I feel is a good friend and fellow blogger - NailsIT. 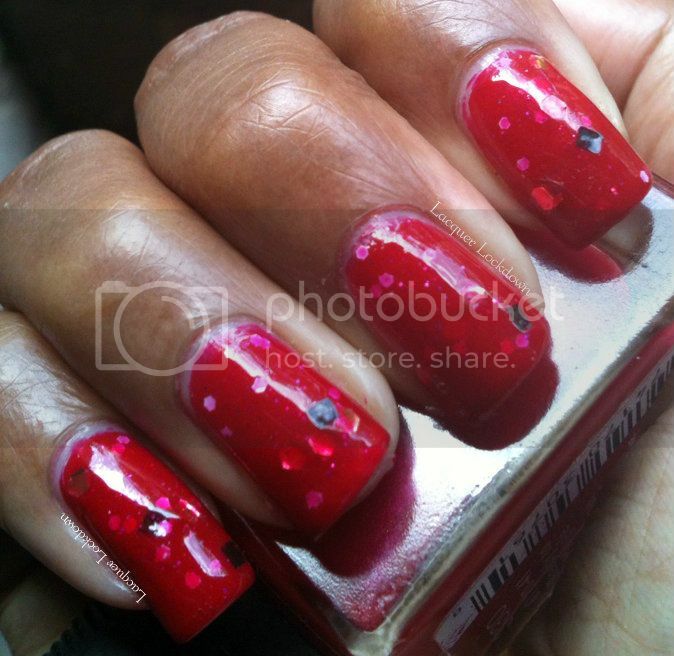 On top of being a real dollface her polishes are stunning, and this one is no exception! This is two coats of Angelique over one thin coat of Sally Hansen Red-dy To Mingle. The minute I saw Angelique I knew she had to be mine. I am a sucker for jellies, but particularly well done red ones. 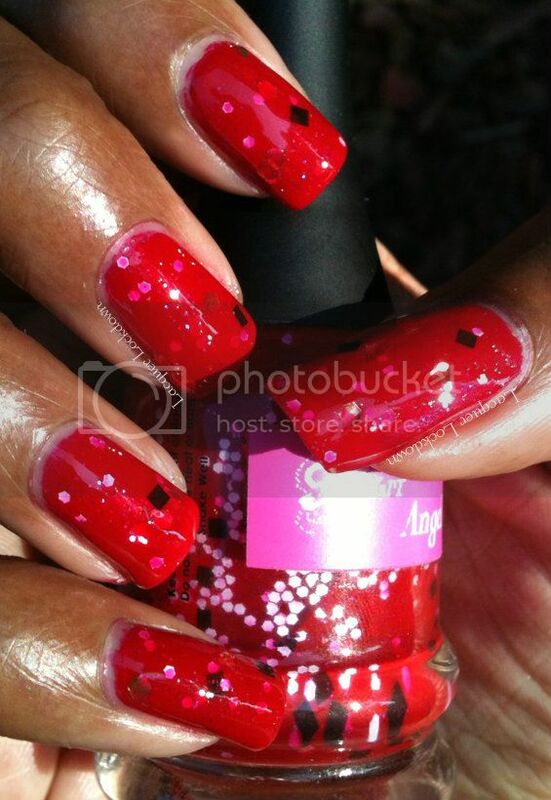 Perfect candy apple red - I love this color so much! The only polish in my stash that's close to this kind of delicious depth and finish currently is Smitten Polish's Fire and Blood. However, it's still a very different red compared to Angelique and has a venous blood hue while Angelique reminds me of very fresh raspberries or apples. 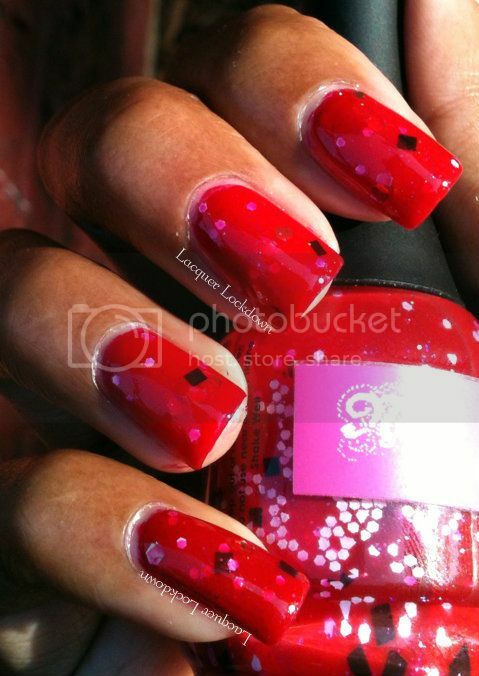 Suddenly in the shade you can see those gold hexagons and pink microglitter popping. I did have to use two layers of Poshe to get a smooth finish because of the square shaped glitters, but it was totally worth it! Lol yeah my nails are glowing like the sun! I love the square bits in this! Gorgeous!